Supporting the creation of protected areas such as Thaidene Nëné is a key part of DUC's vision for conservation in the boreal forest. Protecting large landscapes in the boreal maintains key waterfowl habitat and the ecological function of the forest as a whole. Federal consultations to define the boundaries of the proposed Thaidene Nëné National Park Reserve are a crucial next step for the Dene community of Łutsel K’e to see its conservation vision materialize. 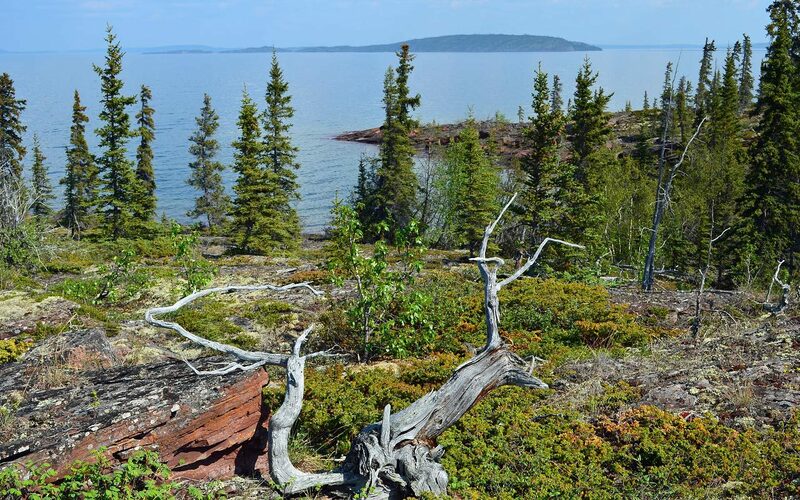 Wetlands dominate the 14,000 square kilometer site for the proposed Thaidene Nëné National Park Reserve (pronounced: Th-eye-den-nay Nen-nay) on the east arm of Great Slave Lake. It’s a landscape defined by water. Thousands of ducks, geese and swans start their lives here each year alongside a vast array of other wildlife. Smith says multi-stakeholder collaboration that is led by First Nations is the key to conservation in the boreal forest. DUC looks forward to seeing both the territorial and federal discussions around the community’s vision for Thaidene Nëné advance. Protecting large landscapes in the boreal maintains key waterfowl habitat and the ecological function of the forest as a whole. Starting dialogue on the boundaries will position Thaidene Nëné to be a significant piece of a protected network that spans the region. Canada’s boreal forest is a top priority for Ducks Unlimited Canada (DUC) due to its central role as breeding grounds for waterfowl from all across the continent. DUC’s goal is to conserve enough wetland habitat to sustain 11 million waterfowl in the region through a balance of protection and sustainable development. Supporting the creation of protected areas such as Thaidene Nëné is a key part of that vision. DUC looks forward to progress on other areas in the Northwest Territories such as Ts’ude niline Tu’eyeta (Ramparts River and Wetlands).